The Dragon’s Lair is now open to all adventures. Today’s patch also includes a massive overhaul to cosmetics, and more! The Dragon’s Lair is a new game mode that will be made permanently available for everyone in the base game of Faeria, starting today. 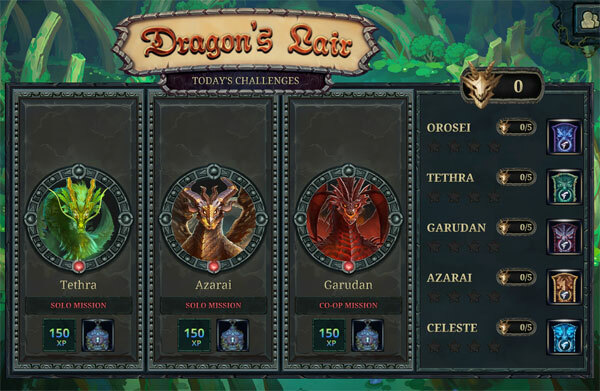 Each day, you will have three dragons available to slay. Two of the dragons will be Solo missions. The third dragon will always be a Co-op mission that you must invite a friend to complete. These dragons will have randomized boards, special powers, and decks. Defeating any dragon awards you a Battle Chest and increases your victory count for each dragon. Defeat the same dragon enough times and unlock unique cosmetics. Each Dragon has their own complete set of cosmetics. Each victory against the same dragon progresses you toward the next reward. At the end of each day, all dragon encounters are regenerated and become available to slay once more. You will still get credit for a co-op mission as long as either you OR your friend has not yet completed it that day. While you must be level 20+ to initiate a co-op mission, you can invite friends who aren’t 20+ to play and both get the rewards if it’s the first time one of you slays the dragon that day. At popular request, we’ve implemented a new shop layout. This new layout will make every cosmetic item and cosmetic item set available for purchase at any time. 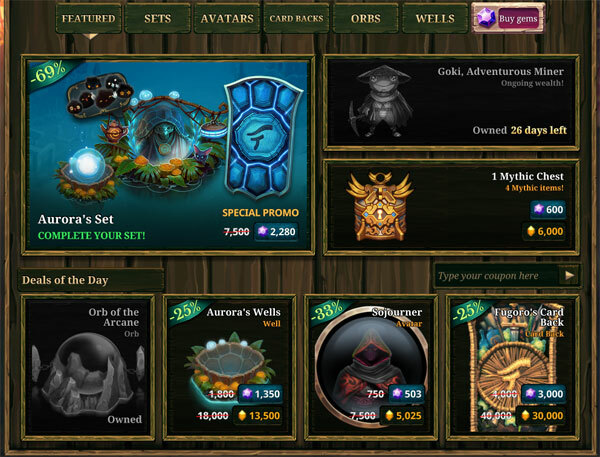 On the main shop screen, one cosmetic set will be discounted every week. Additionally, four individual items will be discounted every day. Click the tabs at the top of the store to navigate through each individual cosmetic category! Cosmetic sets now follow a dynamic pricing model. You will get a discount for each individual piece of a cosmetic set you already own. Purchasing a cosmetic set will always be 20% cheaper than buying the individual pieces alone. Cosmetic sets still contain unique emotes, and purchasing a set is the only way to obtain them. 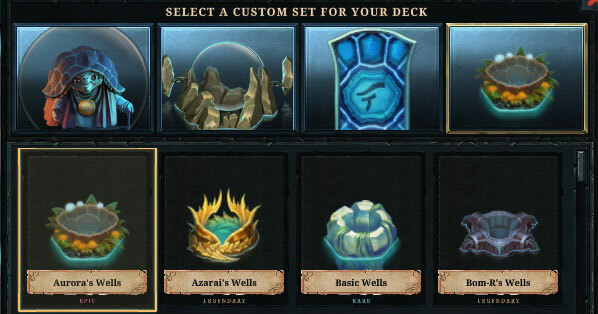 Each of your decks will now be customizable in a brand new way. Click the gear next to any deck name while editing it to change any individual cosmetic for that deck. Each deck may have its own Orb, Cardback, Well, and Avatar saved. You can update them at any time. The price of all gem purchases have been reduced. The Gem starter bundle has been increased from 3,250 Gems to 5,000, and now costs 4.99€. As part of our cosmetic price overhaul, in this patch that we also are adjusting shard rewards for those who own the full collection. Those who have every card in the game will receive 600 shards per level/daily quest/daily login reward, down from 1200. Our intentions when doubling chest rewards previously was to double collection progression for newer players. As a consequence of this quicker fix, shard rewards were doubled as well. Today’s adjustment will return shard rewards to what they were previously, but at the same time we have reworked the shop and changed the relative value of items in a generally lower cost direction. Battle chests rewards remain completely unchanged for those without a full collection. We’ve implemented a change that allows land colors to be printed directly on cards. All cards that previously mentioned a land in text form will now have it replaced by the symbol of that land, as shown above. The purpose of these changes are to speed up the early turns of the game where not too much is happening and options are generally limited. This should help to push both players to the action just a little bit faster, while not putting anyone under too much pressure. Bloated Toad has had its gameplay slightly changed. It now enters play with an enemy toad swallowed, instead of summoning one via Last Words. This change most notably affects its interaction with Animated Banquet, as it will not be able to swallow while having something already in its belly. All cards have been adjusted accordingly for co-op. Any card that says friendly should now work on any ally’s cards. The Legendary drop rate for Mythic Chest cosmetic items has been adjusted. They should now be approximately twice as common as before. Some panels in Play mode have been switched around. This was done in order to make them consistent with the order you unlock them from left to right. 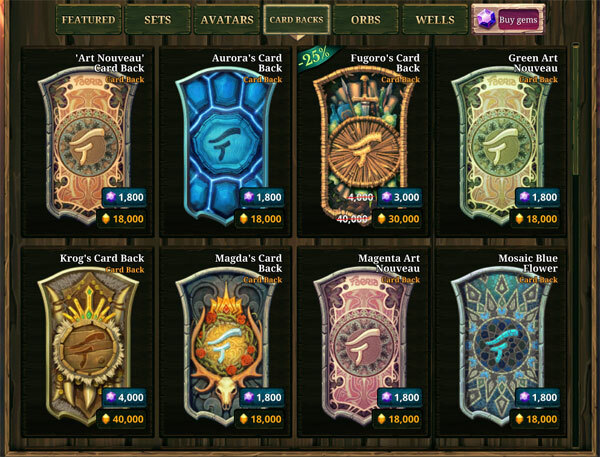 Cosmetics have been adjusted in the way they are loaded in the profile and shop scroll panels. It should improve fluidity when scrolling through panels full of cosmetics. They will load & appear only shortly after their slots are kept visible to improve performance. Optimizations: The size of the client has been drastically reduced from 3.6GB to 2.1GB. RAM use should be down as well in certain areas of the client. 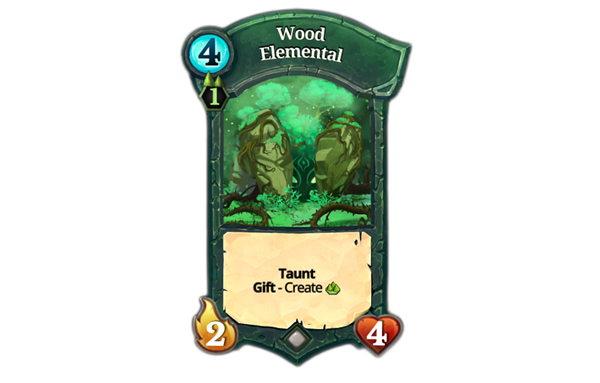 Thank you for playing Faeria. Remember to join our Official Discord and chat with others live about the patch! Does this mean sets (and therefore emotes) can no longer be bought with shards? The sets themselves cannot, but each individual item is now on sale for Shards at any given time - except for the emotes, which are still only in the sets.